LMC7660 Switched Capacitor Voltage Converter. Ideal for use as a low current 10mA ..
LMC7660IN Switched Capacitor Voltage Converter, 8 Pin DIP, input voltage 1.5-10vdc..
TPS60400 unregulated 60mA charge pump voltage inverter, with variable switchi..
LM2672M-3.3 260kHz Step Down Switching Regulator. Very high efficiency and o..
LTC1507 500kHz Monolythic Buck Mode Swithcing Regulator. Very high efficienc..
OB2353CP 50kHz Low Power Off Line Mains Switching Regulator. 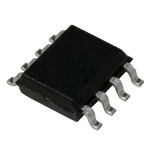 Very high effic..
TPS62152 3.3v 2.6MHz Step Down Switching Regulator. Very high efficiency and..